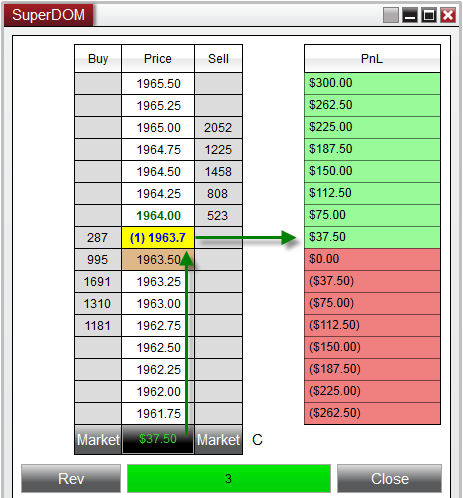 In addition to the standard Price Column used to display bid/ask data, the NinjaTrader SuperDOM has the ability to add additional columns for even further analysis for real-time market prices. 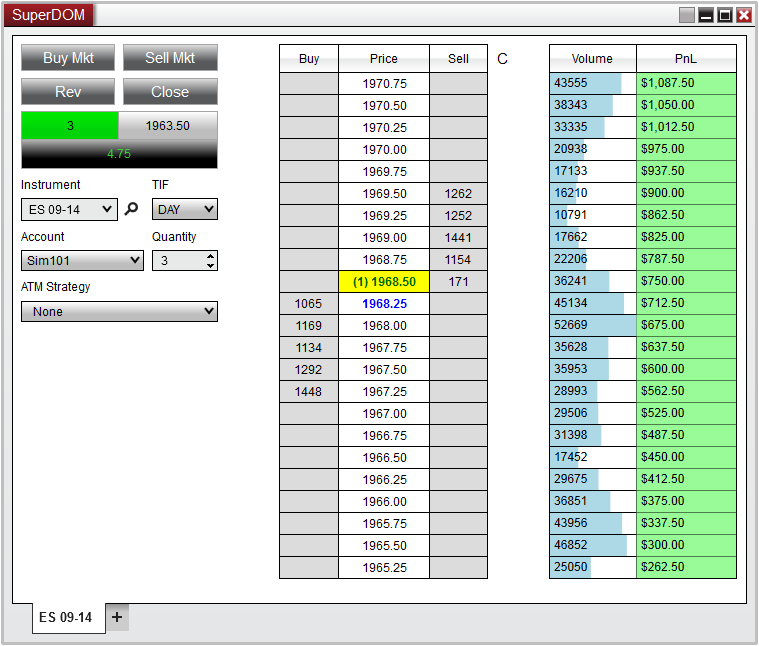 NinjaTrader comes with 4 pre-built system columns (displayed in the image below), with many more which can be downloaded to extend functionality. 2. Highlight the column you would like to edit from the list of applied columns (as shown in the image below). 3. Once highlighted this column's parameters will be available to edit on the right hand side. Each column will have its own set of parameters specific to that column. Please see the "Understanding the default systems columns" section below for more information on each of NinjaTrader 's pre-built columns. For any custom columns that have been downloaded, please refer to the column's developer for more information on settings specific to their custom column. The APQ column will calculate the number of contract resting ahead of your Limit orders based on the number of contracts that were advertised at the time the order was submitted, in other words - it will give you the worst possible position in the queue for your order - so you know conservatively how many contracts need to be filled before it's your orders turn. 1. Let's say you place a Buy limit order at a price of 1963.50, and at the time the order was confirmed as working from the exchange, there were 1233 contracts working at this level ahead of you. 2. APQ will assume that your order has a queue position of 1234, and will continue to monitor the number of contracts that are advertised at this level, and give you the number of contracts that are remaining based off the volume updates that occur at that price level. •The value displayed in the APQ is a calculation based on the volume from your data provider. For simulated orders, there is no way to accurately track your order against the live orders that are being sent from the data provider and filled at a live exchange, and as a result, the estimate will have little to no value to your simulation orders. An order placed on a live account would be more accurately reflected, however it should be noted that this calculation is a client side calculated theoretical value. •Stop orders do not have an APQ as it has no queue effect. A stop order will trigger once the market trades at the stop price. 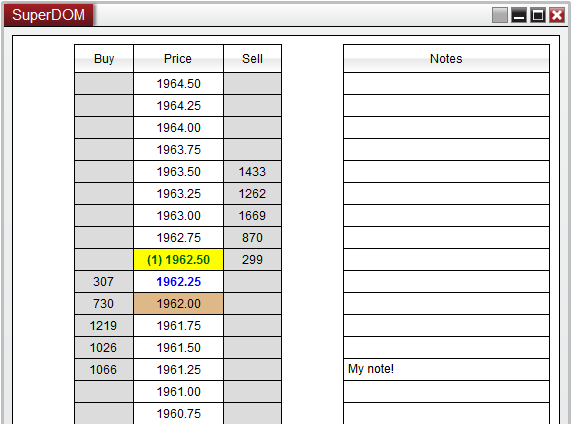 The Notes column will give you the ability to record custom user-defined text at any price row on the SuperDOM. 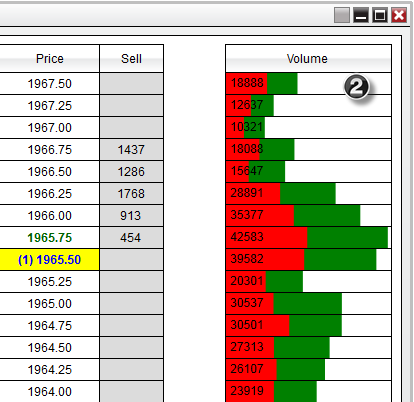 This will allow you to monitor and track individual price levels with any text you may find useful. 3.Press Enter on your Keyboard accept the text. Your custom note will now be synchronized with the price corresponding price row and will remain at that price level as your scroll up or down on the SuperDOM. To remove a note, simply double click on the note row to re-enter the text-edit mode which will allow you to erase the text using your backspace or delete key on your keyboard. Once there is a position opened on the selected instrument, the PnL column will then calculate what you can expect your PnL to be at each price row on the SuperDOM based on the current position size, entry price and the tick size / point value of the instrument that is being traded. The Volume Column will display the number of contracts that have traded in the current session. 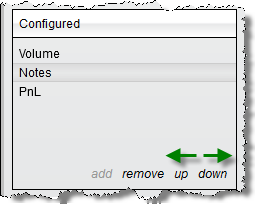 This column has two Setup Properties to determine how the volume information is displayed. 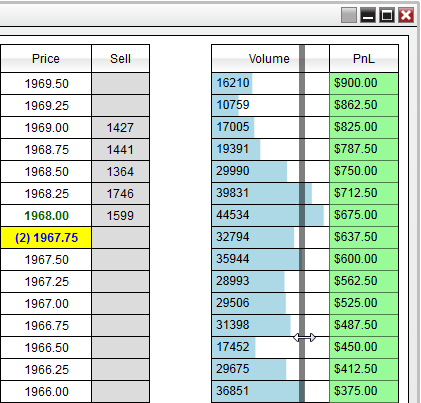 You data feed provider must support historical tick data and is using the Volume Column in Buy/Sell mode must also support Historical Bid/Ask tick data. Note: The SuperDOM Volume Column will reset as the first tick of the next session comes in. If you open a fresh SuperDOM Volume Column outside of the instruments trading hours you will not see any Volume until the next sessions opening tick. 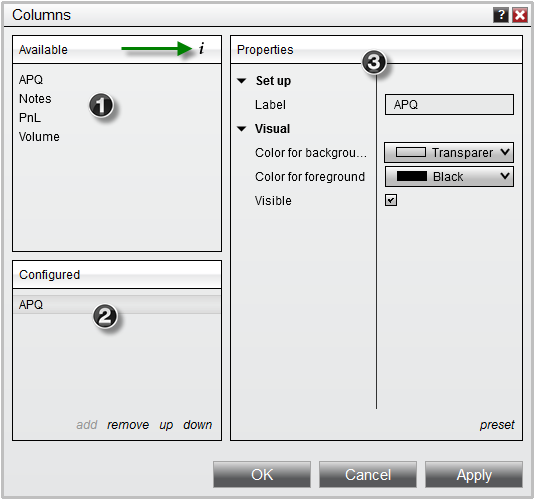 •Open the Columns window (see the "Understanding the Columns window" section above), select a column from the Configured columns list, press the Remove button, and then press the OK button to exit the Columns window. Each column added to the SuperDOM can be individually resized or moved. •Right click on the SuperDOM and select Columns. 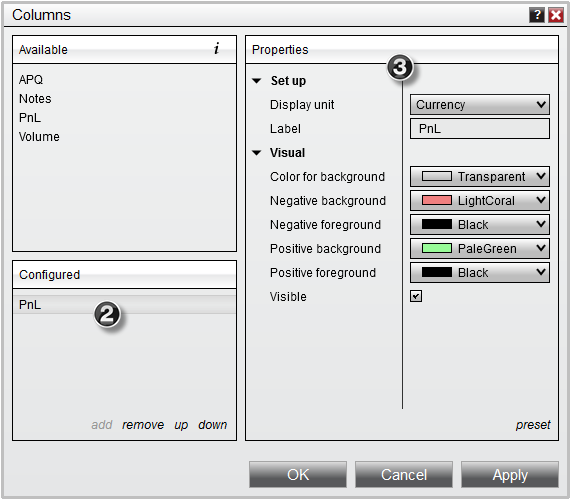 •From the Columns window you can use "up" or "down" in the Configured columns section. By default, the Trade Control will be displayed on the bottom of the SuperDOM. However you can optionally set the Trade Control to be displayed on the left of the SuperDOM Price Ladder for a more compacted view which has been optimized for using multiple columns on the SuperDOM. 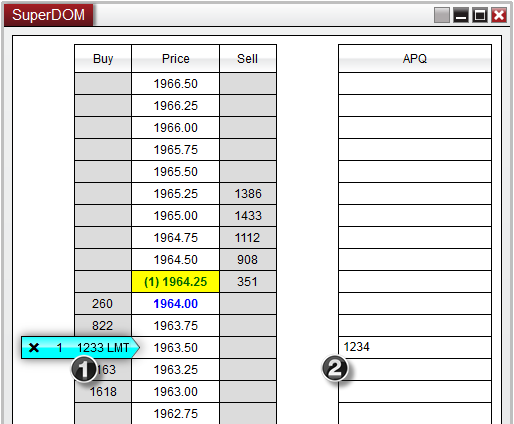 To enable this display, simply right click on the SuperDOM window and select the Trade Control On Left menu item. 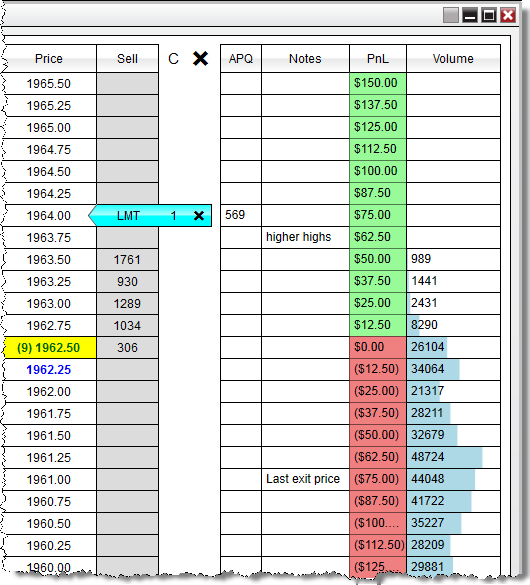 In addition to the 4 system columns that come pre-built with the NinjaTrader application, you also have the ability to create custom columns of your own. 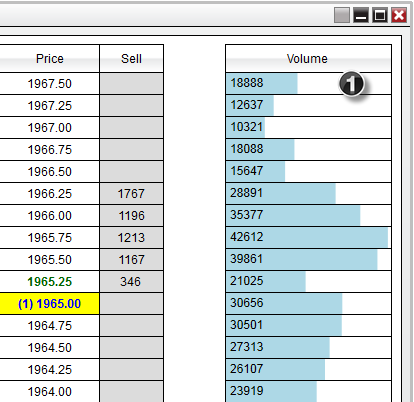 For example, you could create your own custom volume column to apply to your NinjaTrader SuperDOMs. For more information on using NinjaScript to build custom SuperDOM Columns please see the NinjaScript section of the user help guide. The option to hire a http://www.ninjatrader.com/partners.php#NinjaScript-Consultants to build your custom indicators is also available.